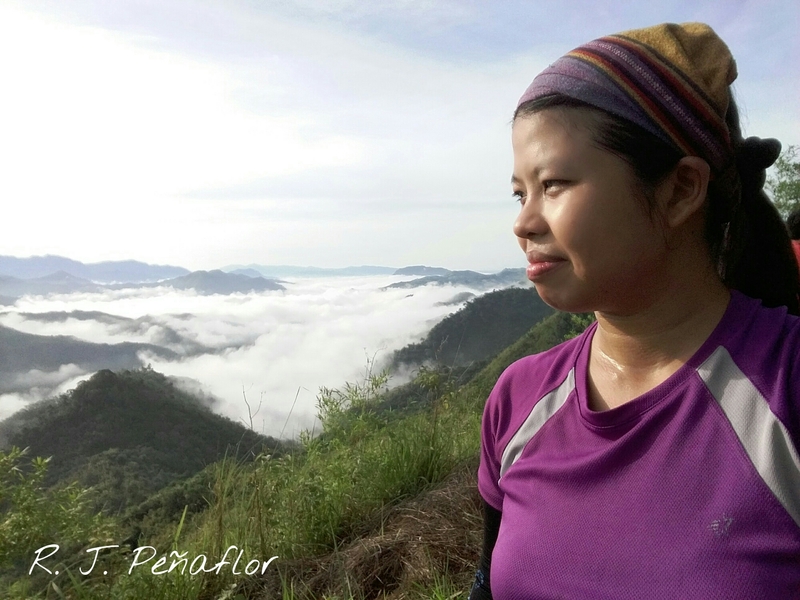 Breathing Adventure: Why Is It A Mistake Not to Wear Raincoats at Pico De Loro? Hikers flocked at the registration area at the base of the mountain. While the other tourists had their raincoats, I was convinced that we were insane enough to trek this mountain in our summer gear. The strong rains had forced us to take the beach as our Plan B. 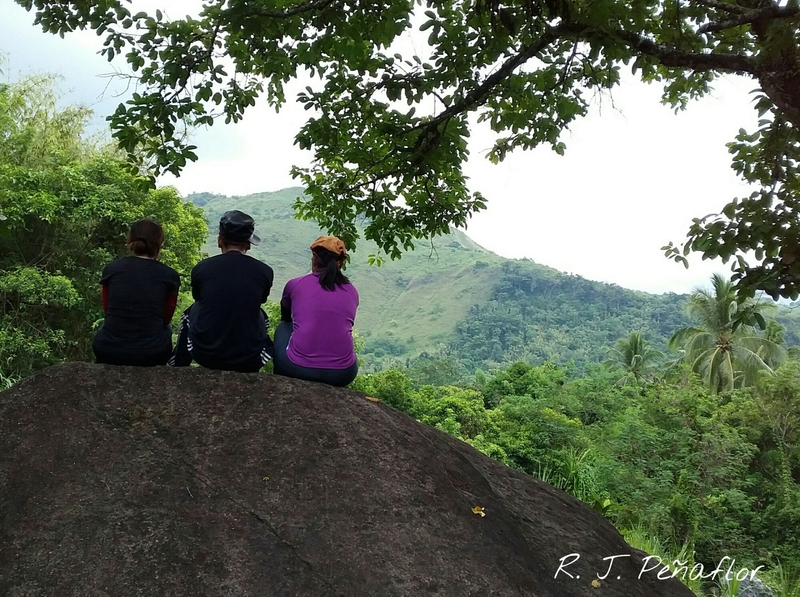 But we later had second thoughts as the tricycle drivers assured us that many hikers had already gone up to Pico de Loro. You read it right. 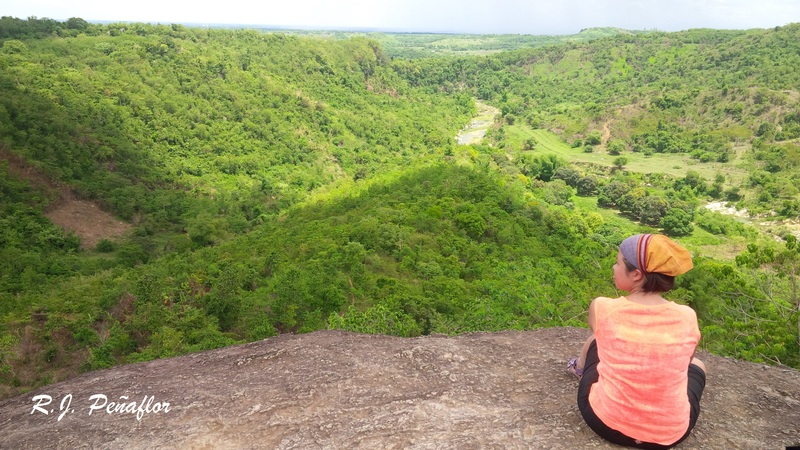 We hiked Pico de Loro on a Sunday while a storm was brewing in Philippine shores. In a desperate attempt to bring all our friends on a weekend, we met on the day rains were raging in an isolated province two hours away from Manila. Still, it was a memorable hike, as all our other adventures were being unique in its odd fashion. 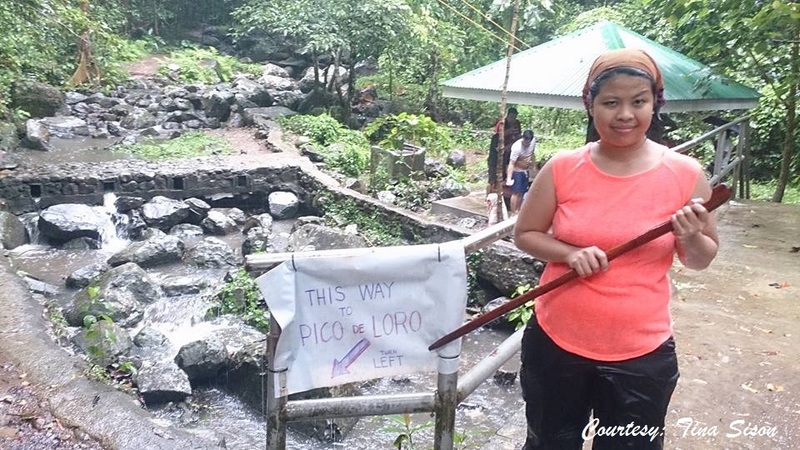 Pico de Loro became immensely popular these months as yuppies in my generation have dared to take hiking travels not found in Manila. 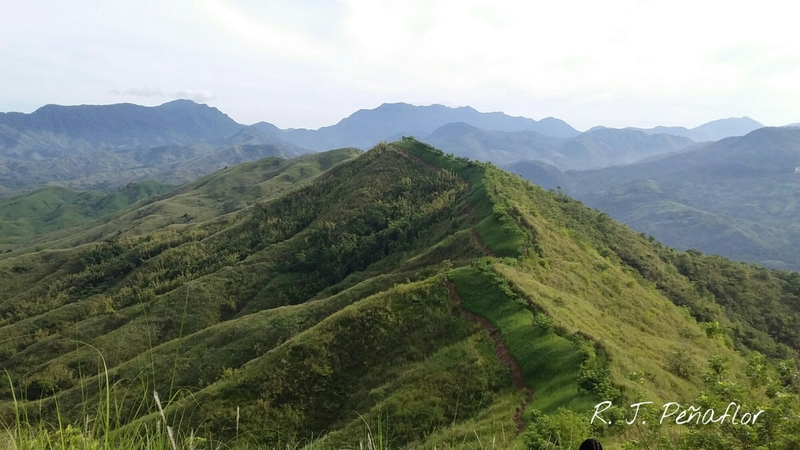 Rising at 664 masl (meters above sea level), this mountain sits in the boundary of the provinces of Batangas and Cavite. The Spanish conquistadores who came to the Philippine Islands named this as such for its peak looked like a parrot’s beak from afar. 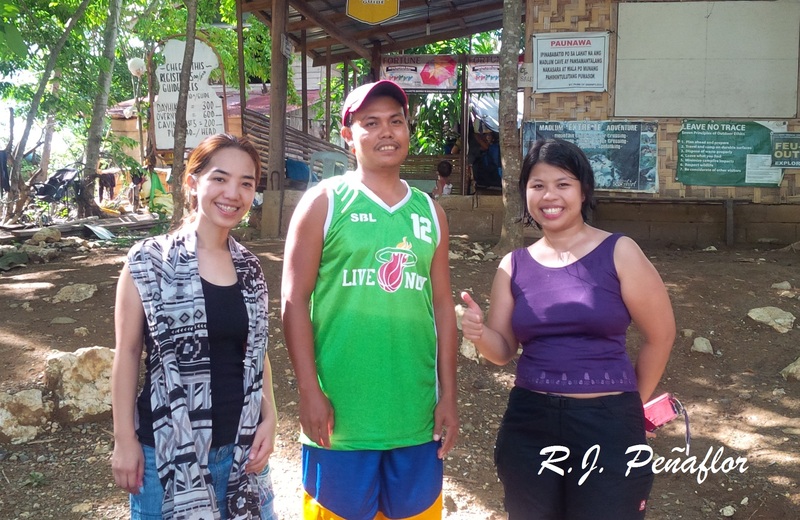 For one to get there, we had to take a bus to Cavite, drop off at a remote point in the town of Ternate, and take a long tricycle ride to Pico’s base. In every hike we took, we made sure that we had enough budget to survive. The tricycle ride, which was at 200 pesos, was more expensive than the approximately 80 peso bus ride. Registration at DENR (Department of Environment and Natural Resources) at the base was only at 25 pesos. But since we were first timers and the weather was bad, we decided to have a tour guide with us. If there are five people in the group, the tour guide would only cost around 1000 pesos. Even though a tour guide is not mandatory, I’d really recommend that you should have one whenever you visit this mountain. 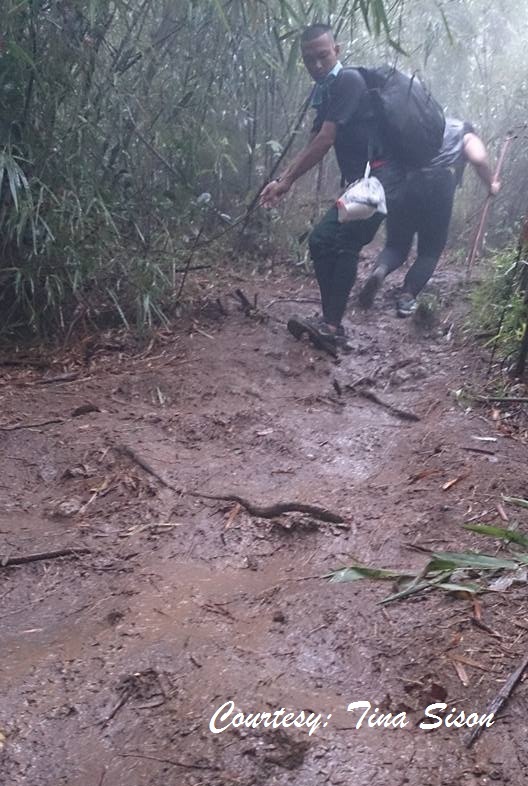 Especially when trekking on a slippery road to the top. They lent us walking sticks. I felt miserable not to have a raincoat in my baggage but I was relieved to have a walking stick with me. This helped me have a good balance and it kept me from skidding down the trail. I purchased trash bags to cover my bag and my head and shoulders. Although I tried to hike with an open umbrella, I tucked it back to my bag so as not to disrupt my balance in this rainy trail. of the rocky creek at the start of the trek. We were walking deeper and deeper into the foresty path. The tall, flourishing trees were covering the skies. The rain kept on pouring and the winds were howling loudly. 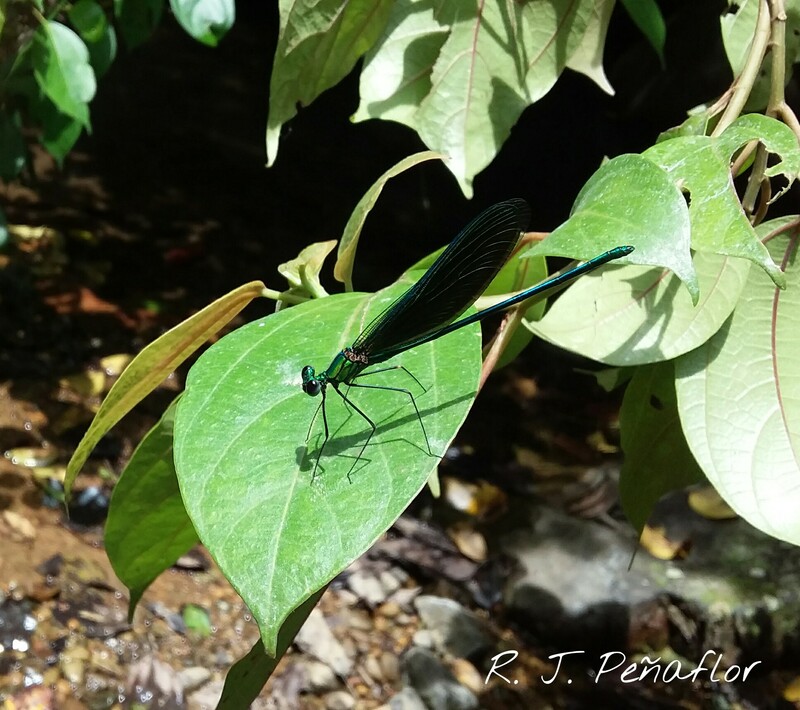 I came to the point wondering what we were doing in the heart of a rain forest in this rainy season. The guide, named Marvin, helped us to keep from slipping on the steep and slippery parts of the trail. 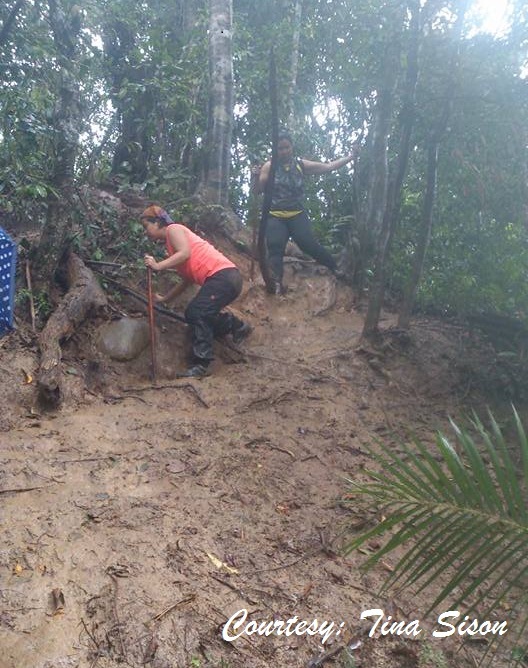 The rains had made the trail even more dangerous, as mud had already made it quite precarious. I commend him for being gracious enough to make sure that none of us would have accidents in this journey and for carrying my immensely, heavy bag. Unfortunately, he had slipped on the trek a number of times when we descended back to the base. 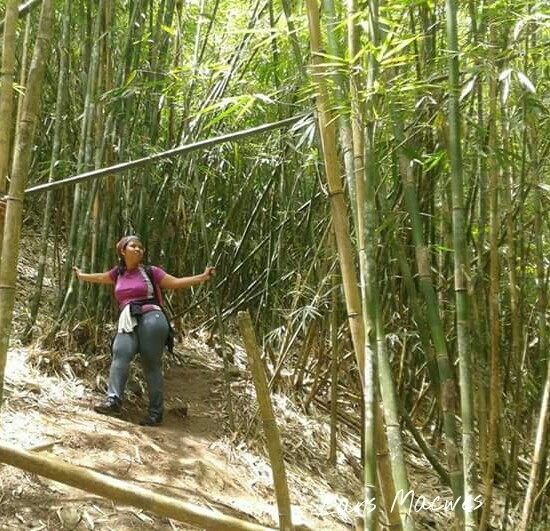 Fallen trees, steep trails, and bamboo groves. These littered in the forest, giving us an enchanted feel. Add that up with torrents of rain, we looked like going into a jungle war zone. 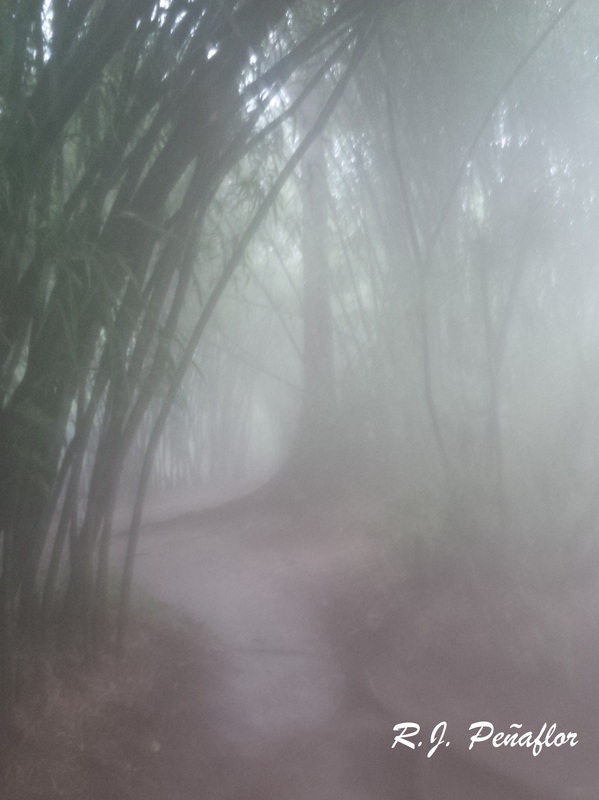 But coming upon the bamboo groves near the first peak, it gave me the feeling of entering an elfin kingdom. A sudden change of scenery mystified us for a while. 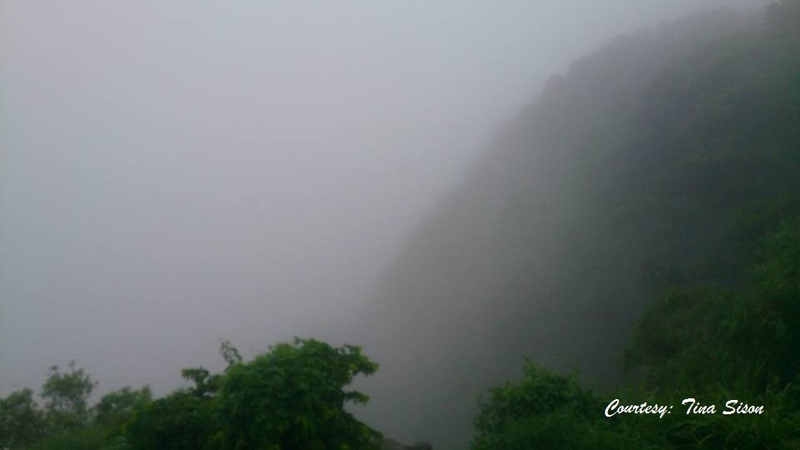 But the heavy mist held back the wonderful scenery which everybody was talking about and posting in social media. peak. Plastic bottles and other non-biodegradable trash thrown by irresponsible tourists littered near these stores. Marvin told me that authorities are going to take action to remove them from the site. It was already mandated that these were already banned in order to avoid trash on this mountain. I just hope they would take this action soon. I just even hope that more tourists would be considerate enough to bring home their own trash. No one dared to climb the monolith at the very peak. That was supposedly the “parrot’s beak”. 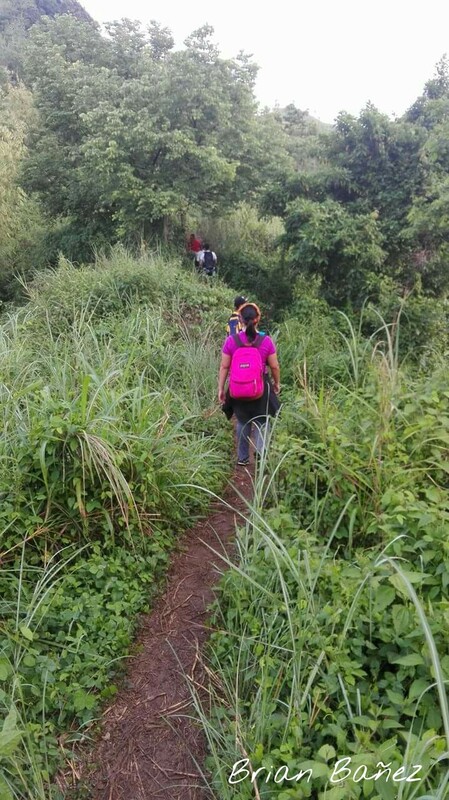 Although there was still remaining trail to reach the top, we decided not to go through it, since the sightless view would just be equally disappointing. Instead, we posed for pictures in the cold, cold rain. not stop. The plastic bags on my head and shoulders were slowly being ruined so I ended up being drenched all over. We had to climb down carefully, holding on to trees and our walking sticks with care. At that point, I appreciated our trek on this mountain even more. Perhaps, because I became quite faster in trekking mountains despite of this unsafe path. Maybe because I was confident to put my weight on this walking stick. Or maybe because I had trekked a few mountains already. When we came to the creek, I knew it was almost over. I felt like I’ve conquered more than the peak or the monolith. I guess, I have conquered my fear of losing balance over a perilous trail. I have survived a dangerous trek in such a bad weather. But because we have not been on the top of the monolith, I swore to myself that I will come back again the parrot’s beak. I knew it will just stay and wait for me. But, let me wait for the sun to shine again. We had to eat something hot before taking a shower in an apartelle quite far from the mountain. We wanted clean, warm water to wash with but we ended up having cold, tap water. At almost 7 pm, we were able to take a bus back to Manila. The rains still have not stopped even as I got home. 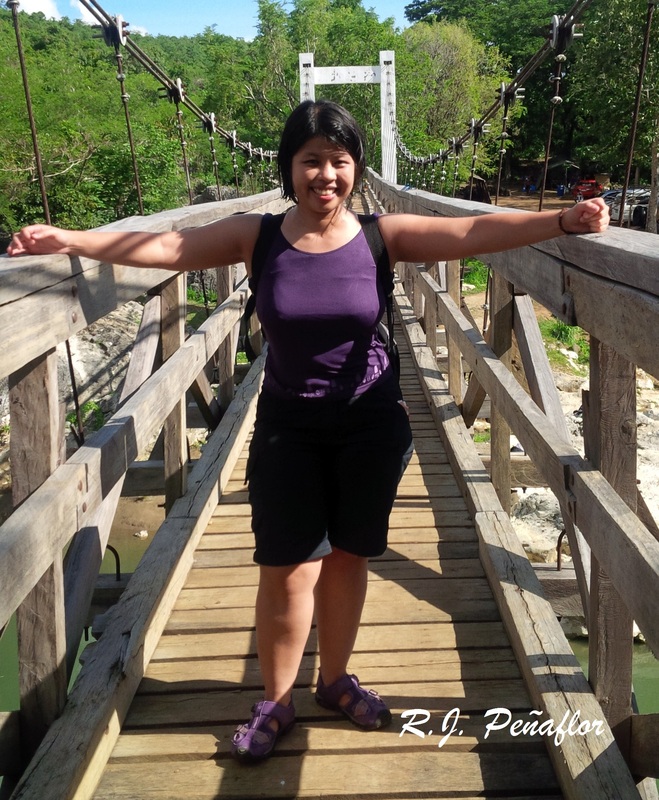 The sound of water splashing beneath the bridge welcomed us after that long, rocky, brain-jarring tricycle ride. The air that blew on our faces was getting even more sultry and humid. The sun was already glaring high above the cool shady trees. It was already late in the morning for we had left late from Manila. There were already other hikers who came before us. But I guess we were quite on time. I was glad to feel the countryside again, far away from my home yet close within my territory. easy trek to go through, it would only take about thirty minutes to get to the top (almost an hour if you have countless rest periods. So, better eat a banana first). 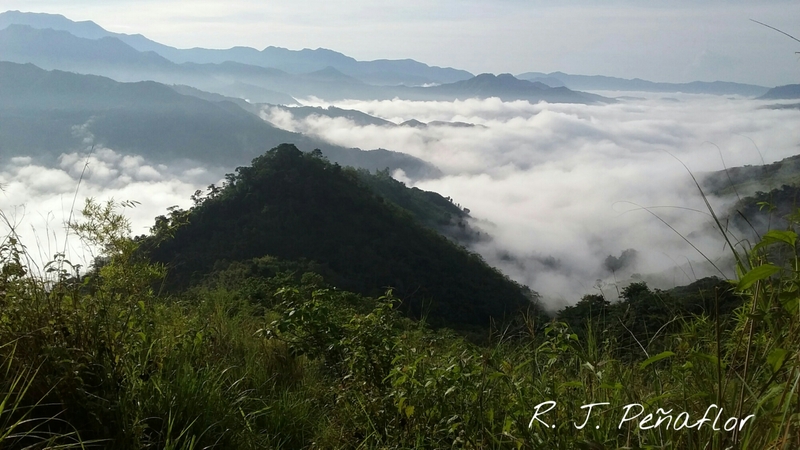 It stands at 196 masl (meters above sea level ). It may not compete with the other giants we have conquered, but as always there’s having the price of having a good view, a memorable experience, and an achievement after getting to the top. I felt like a stranger in my own province. 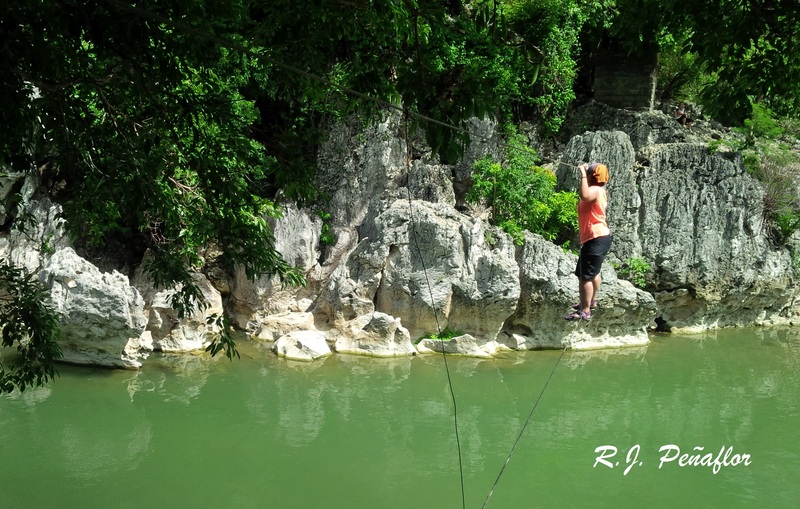 Living in another town in Bulacan, I did not know this little piece of adventure myself until a friend recommended it to me. From my hometown in Sta. Maria, it would take about an hour and a half to three hours to San Miguel. However, a bus ride from Cubao is faster, taking only about two hours. Since there is no direct transport system from my town to San Miguel, going to Cubao would be my best option. Just drop by Baliwag Transit or Five Star Liner and take the bus going to Cabanatuan. Bus fare is only P117. My friend and I took the trip on a weekday since most tourists flock in at weekends. As I watched out for the road signs, I felt like being transported in time. 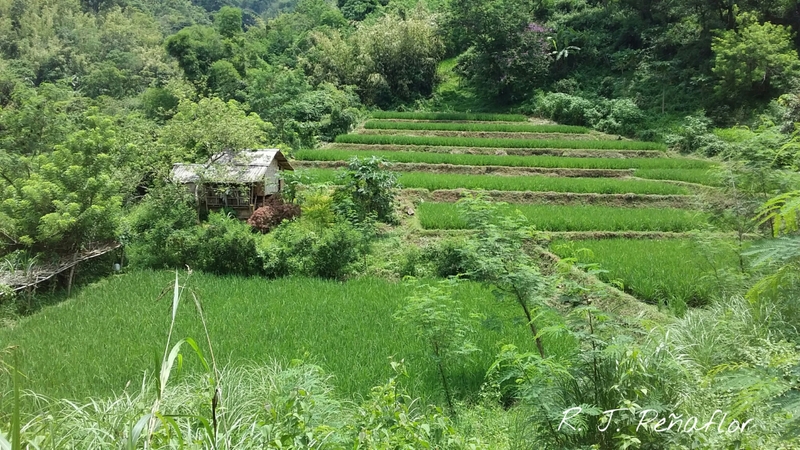 The roads took us to quaint little, farming villages, knowing that the air outside was scented with newly planted palay (rice) and fresh soil. 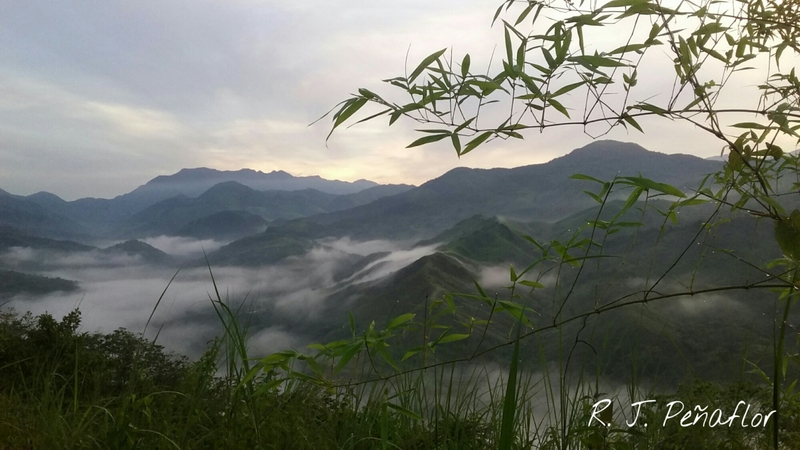 But our destination is more than rice paddies and farms. We got the first knack of adventure when we had taken that bumpy tricycle ride from Camias, San Miguel which was supposedly at P240. But, we were given a deal of P180 on this ride. 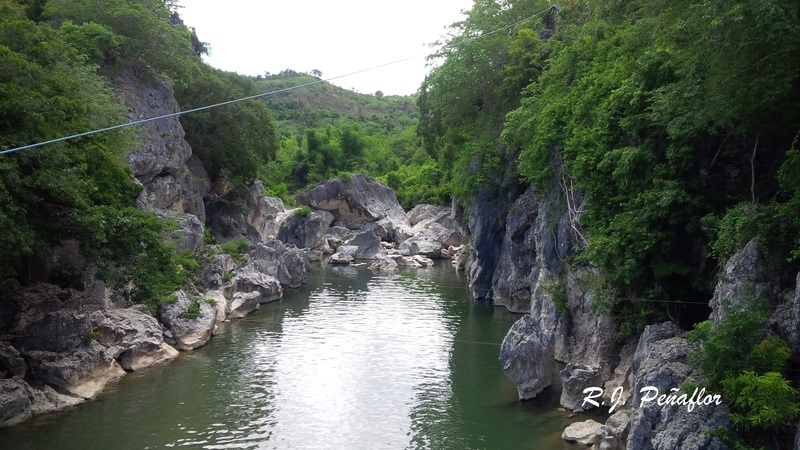 Given the name, Biak-na-Bato, or “split rock” in English, is a valley-like terrain divided by a long winding river. Looking at the crystal clear waters, one might think that these are too shallow. 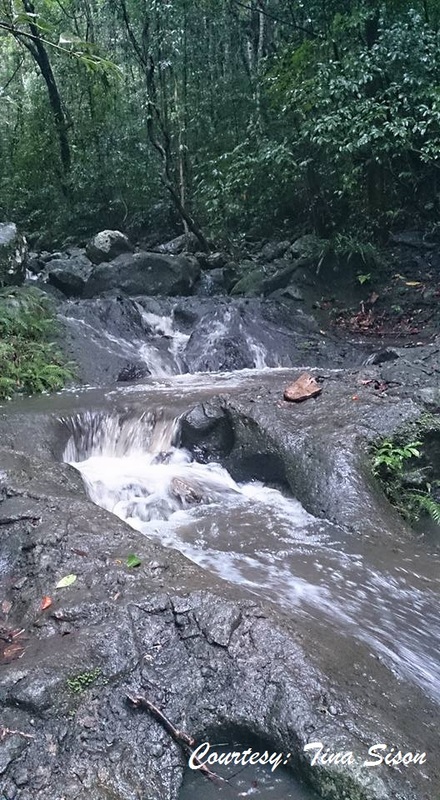 However, this tourist spot is notorious for the sudden rise of its currents during rainy days. It would be better to arrive here on a dry, summer season to enjoy more of its place. Once we treaded the path to the peak, I suddenly had to battle again the feeling of falling over. Although most parts of the trail are easy, there are some really steep places. Most of these areas are covered in limestones, which spike out on the edges of the mountains. I always had the difficulty of getting a good footing on such trails, but I took them slowly but surely. The sun was already getting a bit harsher on us. We had to stop occasionally for water breaks and banana snack time (still a lot of them in my bag). Upon reaching a smooth rock on top, we reached the first part of the peak. At that point, we could see the peak of Mt. Arayat in Pampanga inviting us to give her a visit sometime soon. A few minutes more, we moved on and reached its top. The sight below was a treat. On the other side, there’s the peak of Mt. 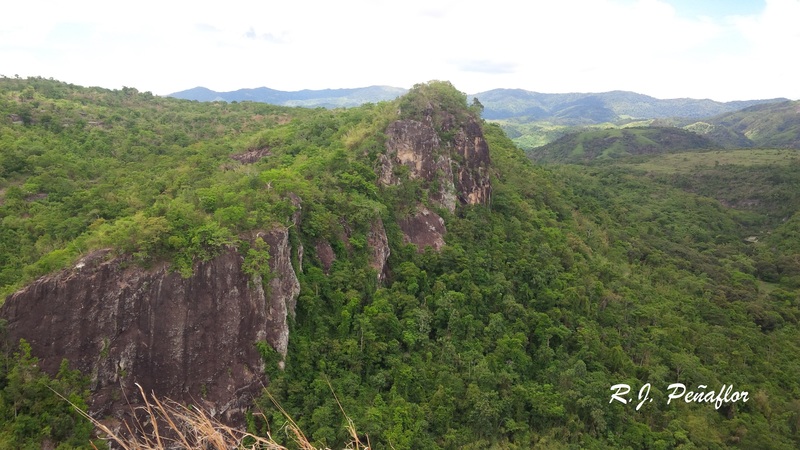 Gola, another mountain in Biak-na-Bato. Way down below is the Madlum River, winding all the way through this terrain. But from beyond, the rain clouds came and loomed over us. It’s funny how we had to open our umbrellas as we descended down the mountain. 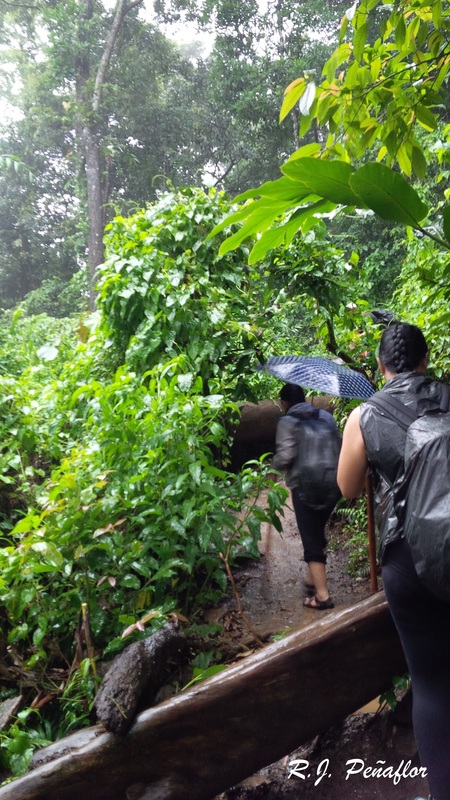 I advise you to bring raincoats all the time when trekking. It’s better to keep your hands free so you can hold unto rocks on steep portions. The weather is even more moody than our emotions; it can suddenly change in a minute. 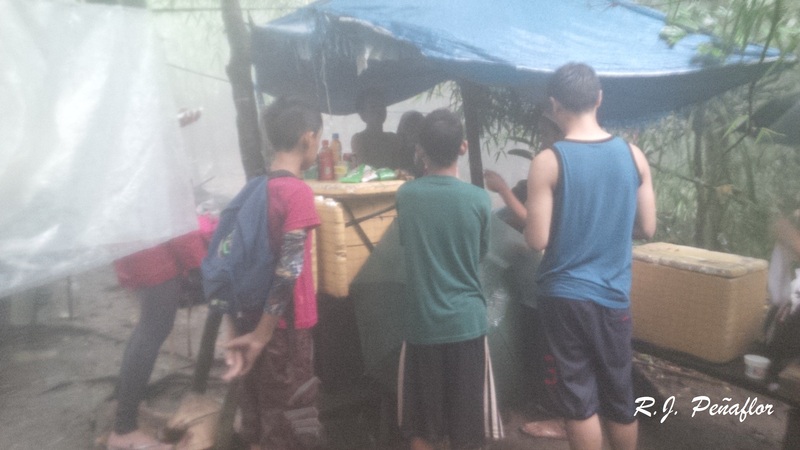 It was not a dangerous downpour, but the mud heavily stuck on our shoes and sandals so we had to walk barefooted. Our tour guide knew where the rain would fall, so he led us to a safer route. 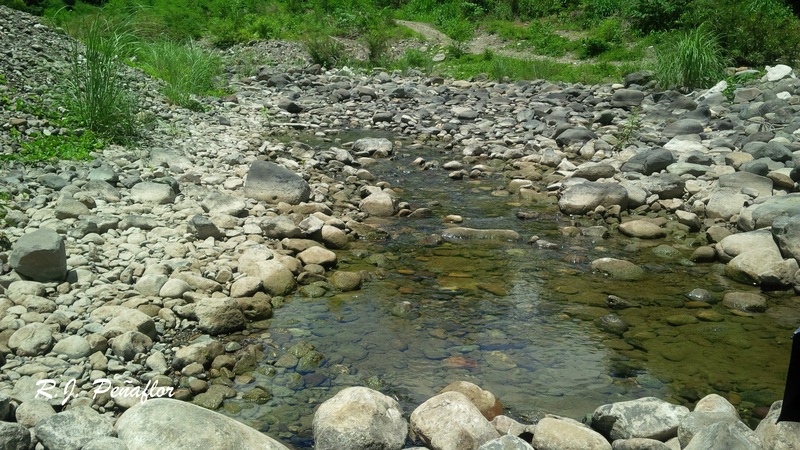 Fortunately, it did not rain upon the Madlum River, so we spent the time washing our shoes and feet upon the clean, crystal clear waters. 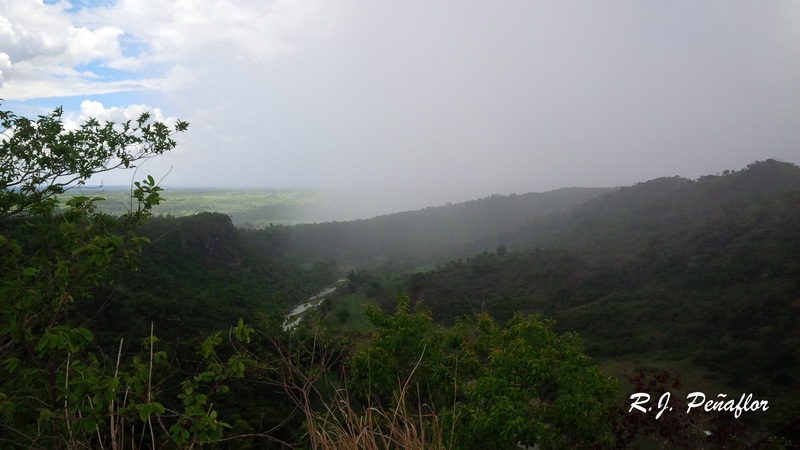 rains had fallen on that portion, our tour guide said that it might not be wise to go there at that moment. The path in that cave, riddled with more jagged limestones, can become dangerously slippery, especially for my round, little feet. 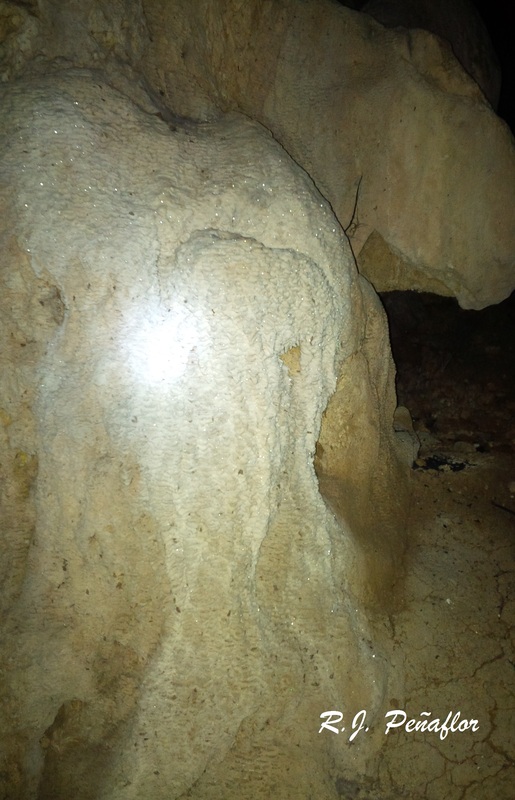 Instead, we explored the Madlum Cave. 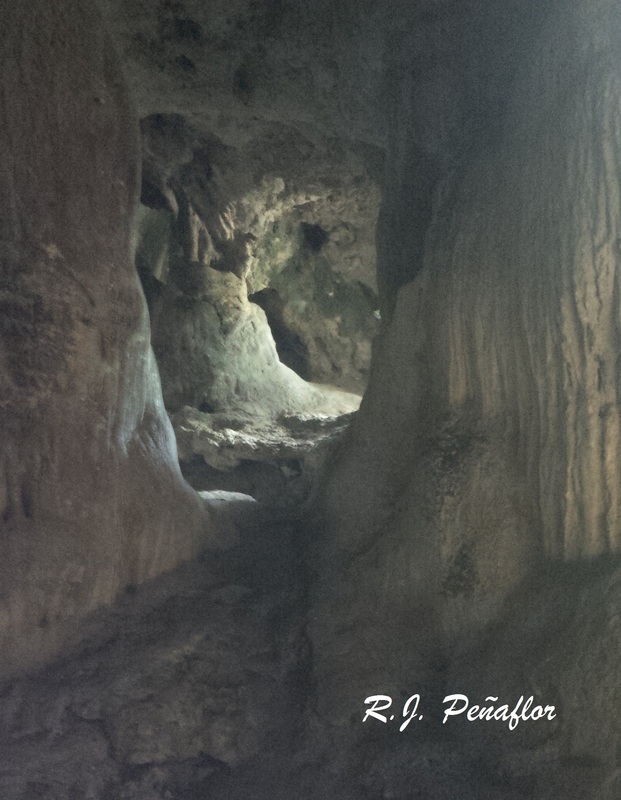 From the Kapampangan word, the Madlum Cave, which means madilim or dark, is eerily dark and silent inside, save for the tiny screeches of the fruit bats living there. Even if I tell you that this cave became a production set for the television fantaserye, Mulawin, you will not find any superstars in there. This small cave has nursed glittering stalagmites, stalactites, and history. From its hushed walls, I learned that San Miguel was once a part of the province of Pampanga. And from this cave, the image of their patron saint was found. Thus, this was how San Miguel was given its name. So much for the history and the little magical chant that we had inside (I won’t tell you because you have to discover that). 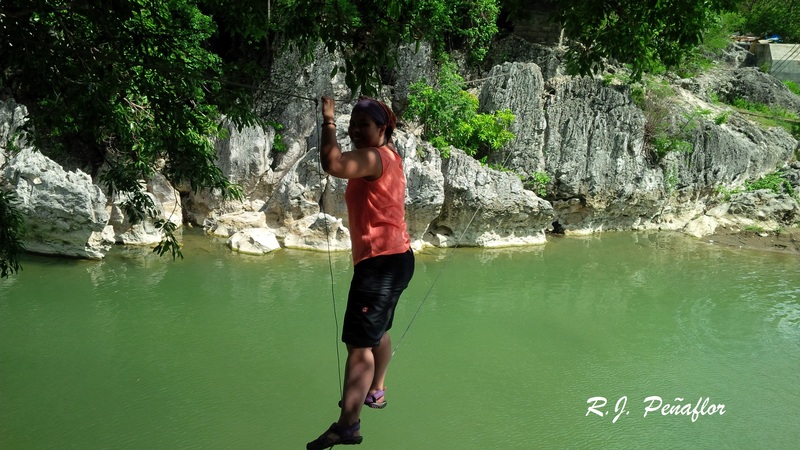 We had to try one more escapade before going home: the monkey bridge. To cross the other side through merely two thick wires suspended over water might seem to be a horror story to you. Don’t. Think of it like you’re playing monkey bars in a playground. One wire balances beneath our feet and the other is held by our bare hands while crossing it sideways. I’m sure this looks familiar to you if you’ve seen that milk commercial of two small children crossing such a bridge while going to school. have a trusted tour guide with you. That would make P300 for the tour guide and P200 for every cave visited. The bigger you are in a group, the better you can budget and share in these expenses. 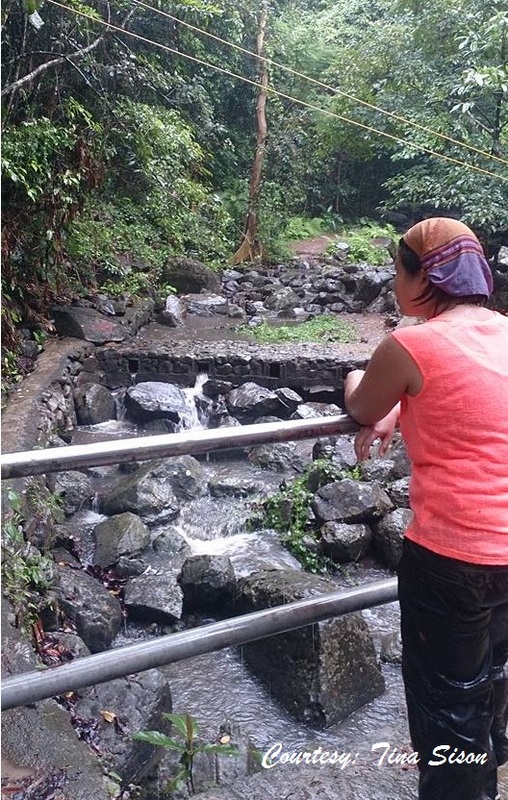 If you’d ask me, I’d like to return to Biak-na-Bato. It’s ironic how rare I’d get to visit this part of my province. 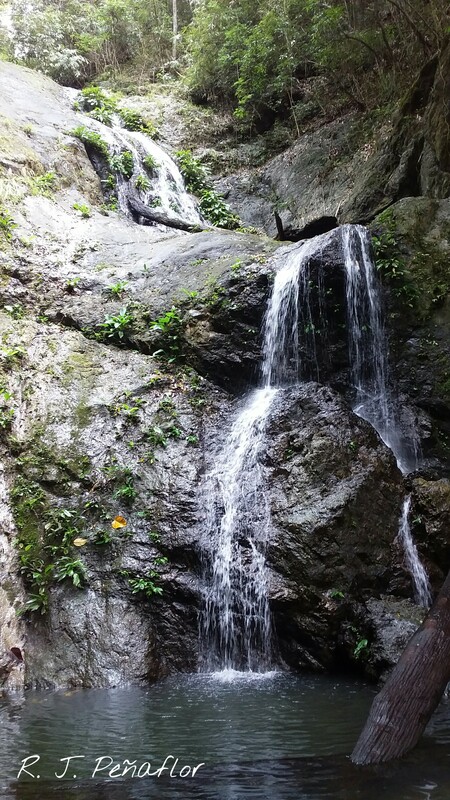 After this third visit I’d like to add more, and drop by other portions of Biak-na-Bato that I’ve not explored yet. Nowadays, a lot of us express our patriotic spirit even more. I’ve seen more and more people wear “Tatak Pinoy” t-shirts on the streets (even foreigners are delighted to have one), more shoutouts in social sites expressing “Pinoyness”, and an articulate appreciation of who we are in the broadcast media. We seem to love our nation more than ever before. But is this really enough to prove our love for our Inang Bayan? We love to express ourselves. In our willingness to voice out our feelings, sometimes we easily criticize anything we don’t see right. One time, I was on the jeep accidentally overhearing a conversation between an opinionated passenger and the jeepney driver. 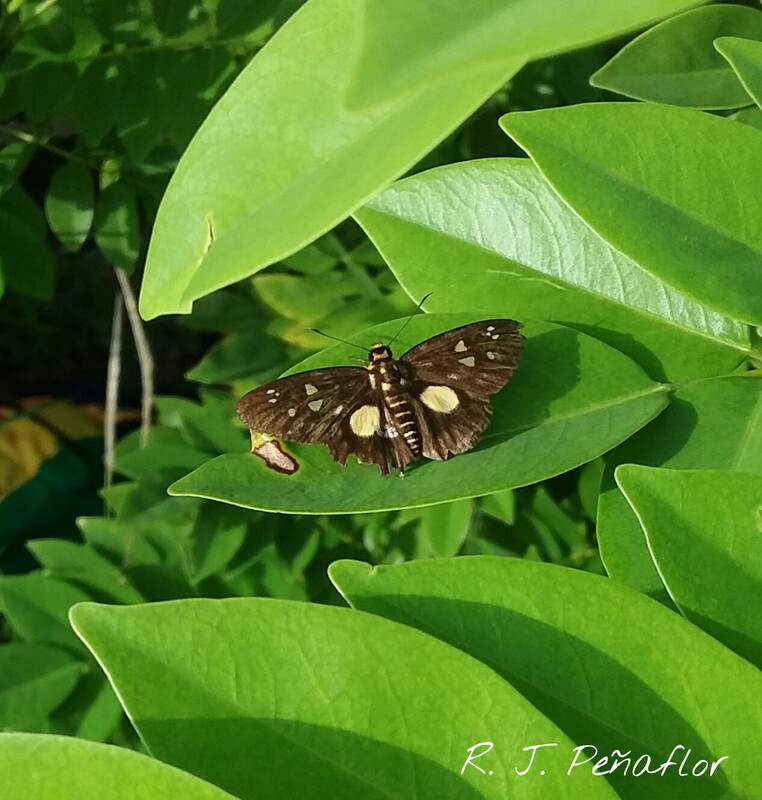 When the jeep passed by a huge, smelly mountain of trash on the sidewalk, the passenger clicked on his tongue, shook his head, and said, “Wala talagang disiplina ang mga Pilipino.” Take a look of himself…is he not totally Filipino? We blurt out our disagreement with the wrong things we see…which I also do. But sometimes we tend to go sideways with our thoughts. We agree to what’s right and to those things we disagree with we shift the blame to others. Just like the guy in the jeep, most of us like saying that our own brothers are no good than us in an indirect way. But we do not realize these people are completely like you and me – totally Filipino. I wonder if we make an effort to keep the value of our cultural pride. I was very surprised one time when groups of young boys who claim to be Badjaos sat on the doorway of our jeep and sang for a penny. Looking at their historical heritage, I wondered how they can be willing to sell the pride of their race – while we ourselves exploit by looking down at them. Though I am not sure if they are really Badjaos, I couldn’t help think that this made us label them negatively. To think, the variety in our culture made us unique as a nation. 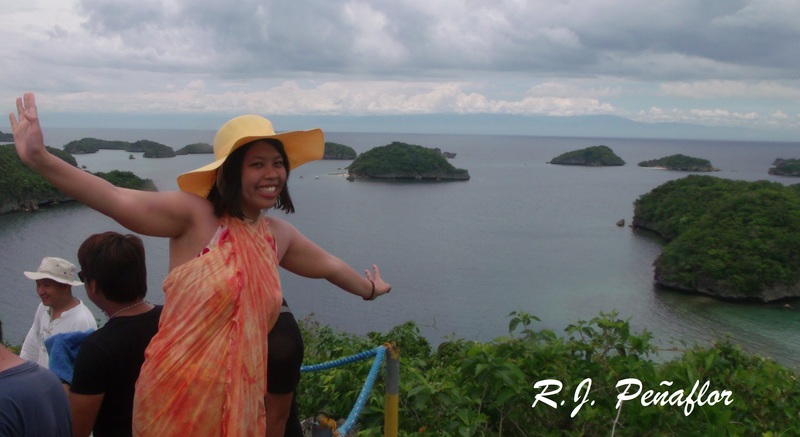 The Philippines does not only have 7,107 islands but also has hundreds of dialects and ethnic groups. Each one is unique, if not mixed, to one after another. Though we have picked a pieces of Asian Eastern and European cultures, the results of this is unique in its own sense. It’s so sad that most people do not take notice of other cultures and tribes that thrive in the other parts of the country. We had made a wrong sense that these kinds of people only live in the past and just stay in our textbooks as the facts to be unlearned after graduation (which I also admit I did). When they come and invade our cities, we are irked. But we do not realize this destroys the pride of their heritage. Most of us think they are just nuisance and wish that the government sends them away to somewhere we don’t care about. When I think of these things I feel guilty I had the same thought – these people are our fellow brothers and sisters – totally Filipino. In fact, we need to learn from them. It’s not bad to enjoy going to tourist spots to enjoy scuba diving and city tours. We do learn from them, don’t we? But I believe one will learn more when one stays to learn the people’s lifestyle. 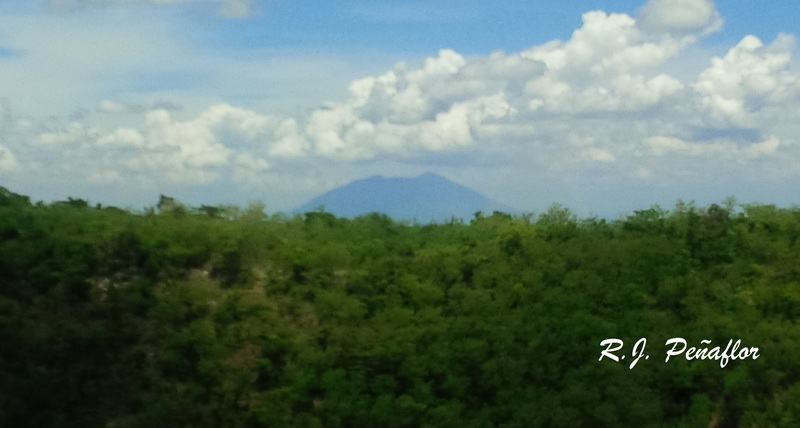 When I had gone to Bicol for a vacation, I got a hold of more than sweet pili and a peek of the Mayon. I appreciated the place even more because of the people whom I ate and lived with. I got a hold of their simple, quiet lifestyle that was totally apart from my fast-paced environment. I never thought that there are so many differences between my culture and their culture – the language itself, to start with. The culture of the other ethnic groups is also very important to be preserved. However, we just let them rot away by degrading their sense of existence. That’s why it’s disparaging to hear of ourselves just mumble away against things we do not understand. Sometimes, we do not realize we ourselves are the part of both problem and solution. We can be indirectly part of the problem like environmental crisis and degradation of culture but we can counter them back. It’s good that no superheroes were created. Whatever we have ruined must also be fixed by ourselves. Of course, we cannot do this alone. That’s why we have bayanihan, right? Why not focus on the good qualities we have as a Filipino? Think again on the words we have said, begin by doing small good things that will help us grow as a nation. Whether that would be picking trash, cease to be self-righteous, and help by giving a piece of what we have, I’m sure that could go a long way. So, what’s really the true measure of being Filipino? Yeah, it’s great to see the Pinoy map hanging on your shirt and the Philippine flag as your keychain bag. But I guess it takes more than artifacts and social sites to show that you are proud to be Pinoy. It takes sincerity to be one. Our character in real life situations should reflect that we are truly Filipino in mind, in words, and in action. I never thought it would be. I had written loads of other dreams wherein we transferred to bigger sheets. Too bad,I couldn’t check on them for I couldn’t remember where I kept it. The five-year goal has passed. Now, I am at the limits of my four-cornered world (again) but here comes another blessing in a helpful form. 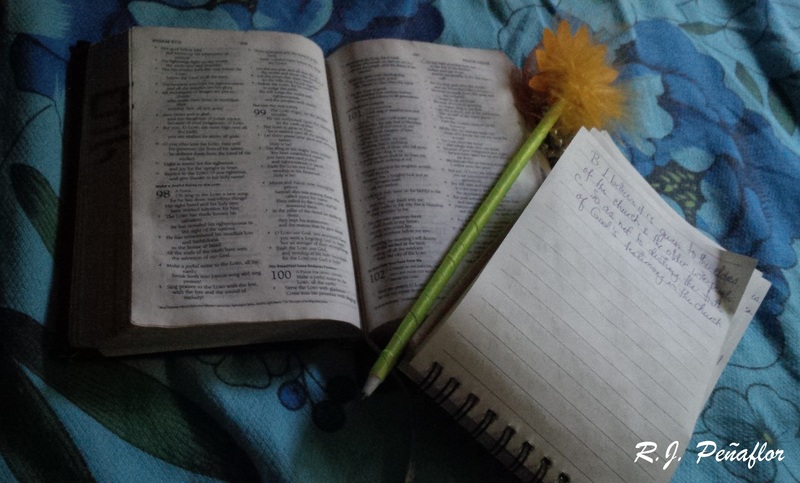 Instead of a small receipt paper, I am blessed to have Dreambook. Joining its launch at the World Dream Day last September 27 at Powerbooks, Greenbelt 4, I was one of those who participated the activities with other dreamers who want to inspire the world. Led by life coach Claude Sta. Clara, we took a review on the dreams we aspire, and take track on its progress. I got the best surprise when I was picked to have a weekly version copy of the Dreambook journal. Now, the Dreambook is more profound and helpful than that crude piece of paper. In it are guide questions to recognize your strengths, passions, and your dreams. Like any activity book, it keeps me engaged, with its colorfully designed pages highlight encouraging quotes. It also gives enlightenment on what you may have missed or what you lack to keep you from getting to your dreams, and how to get rid of them. Aside from answering guide questions, you can keep track on where you are by checking your timely status. It keeps you focused on your goal — to fulfill the dream or dreams that you have been long keeping. The Dreambook is highly recommendable for all. Everyone is a dreamer, and this defines our very purpose on this earth. These dreams are not only for us, but it will bless the many others. Our dreams can come into fulfillment when we pursue them, ignite them, and live them. And so, I have entered a new dream — dreams, rather, in the Dreambook After five years, I would be able to look at the Dreambook, and see where I would be by then. After dreaming of working in the media a little more than five years ago, I now dream to work in an international media company, and have my own show. 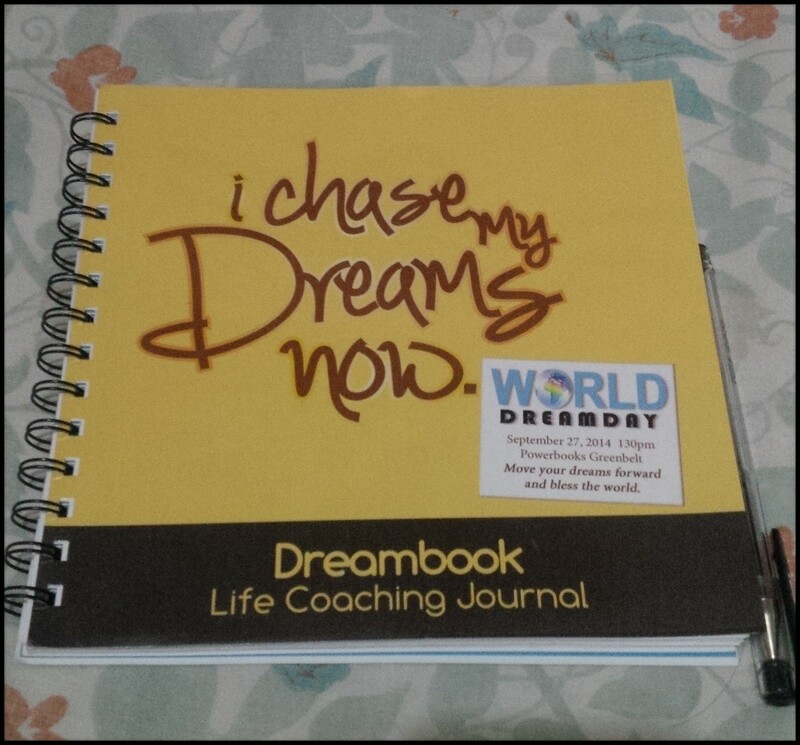 You can grab a copy of the Dreambook at all Powerbooks branches in the Philippines. I guarantee that the inner dreamer in you will be inspired and will rise up through this life coaching journal.